Emily buys a piece of art without telling, Frank, her detective husband. When he discovers the artwork in their living room he becomes incensed and begins devising a way to get his money back. In one perilous evening, Frank and Emily, the art dealer and his wife, and the artist collide together in a tumultuous onslaught of anger, drugs, infidelity, weapons and ultimately the ugly truth. First reading of "The Elephant in the Room" took place at Greystone Mansion on April 24, 2014. Seated at table counter clockwise are: Darren (Daz) Richardson, Christie Mossman, Ellie Jameson, Clete Keith, Stephan Smith Collins, Tom Musgrave, and Whitney Dylan. Seated in back are Betsy and Craig Berenson. The second reading of "The Elephant in the Room" was performed at Greystone Mansion on December 6, 2014. 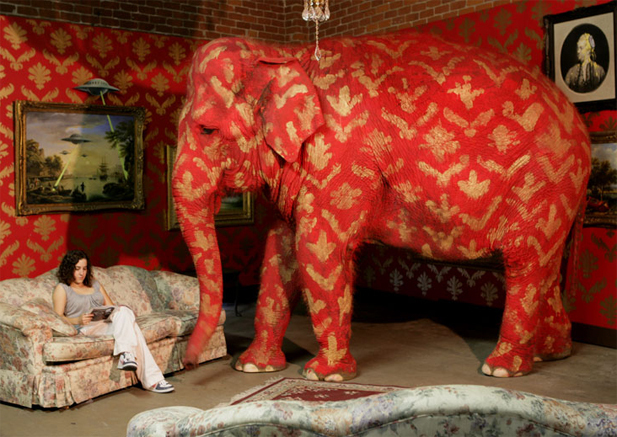 The third reading of "The Elephant in the Room" was performed at The Road Theatre on April 6, 2015. Left to Right: Kevin Shipp (reading stage direction), John Pollono, Laurie Okin, Tom Musgrave, ??? ?, and Ellie Jameson.